Yesterday, I was treated to an advanced showing of Neill Blomkamp’s latest movie, Chappie. The March 6th release of the film seems intended to reproduce the success of other pre-summer blockbusters, such as 300 and Iron Man. As of late, I have begun to wonder if the entire concept of the summer blockbuster as a seasonal occurrence can be challenged, especially given American Sniper‘s outstanding financial performance. But that is a question to be answered this weekend. Part Robocop and part Short Circuit, Chappie takes place in the South African city of Johannesburg, where crime, civil unrest and easy access to assault weaponry have made it tough for the human police force. But Tetra Vaal, a robotics company, has reversed the situation with the Scouts; man-sized droids with titanium shells to shrug off gunfire, and well written rudimentary behavior for handling violent criminal offenders. 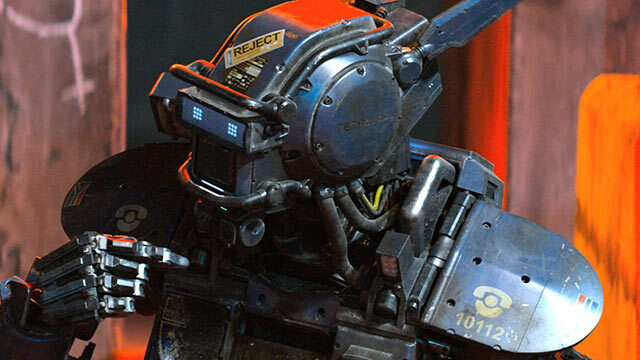 This review will cover the early plot hooks of Chappie but otherwise avoid spoilers. During the opening act, the Scouts are called into action against a fleeing gang run by Ninja and Yolandi (Watkin Tudor Jones and Yolandi Visser of the rap-rave group Die Antwoord) and their buddy Yankie/Amerika (Jose Pablo Cantillo). Ninja’s gang meets up with local crime warlord Hippo (Brandon Auret) for a drug drop-off, but an earlier encounter with the police destroyed the goods. Because of Ninja’s failure, Hippo threatens his life unless Ninja delivers 20 million South African Rands in 7 days. Just then the Scouts arrive with human police back up. Ninja, Yolandi and Amerika escape during the ensuing firefight, but receive a call from Hippo as they return to their hideout, who ensures them that his threats are still valid. Yolandi floats the idea of kidnapping Tetra Vaal’s lead developer, and forcing him to shutdown the Scouts in preparation for a heist to pay off Hippo, and save their lives. At Tetra Vaal, that lead developer is Deon Wilson (Dev Patel), who is celebrated for the huge success of the robotic police units. But Deon’s success came at cost to Vincent Moore (Hugh Jackman), whose mentally-controlled walking tank “The Moose” has seen its yearly budget slashed repeatedly by their boss Michelle Bradley (Sigourney Weaver), and has yet to win the interest of the Johannesburg police. But Deon has a greater vision for his creations. And after nine years of development, he has finally created what he believes is a true artificial intelligence software package. Against Michelle’s rejections due to insurance risks, Deon steals both the guardian chip and the ruined pieces of Scout 22 (voiced by Sharlto Copley) despite warnings that damage had sealed 22’s battery to his chassis, preventing replacement. The guardian chip is needed to install updates to the Scouts, and its disappearance is discovered by Vincent. It was fun to see how Blomkamp and screenwriter Terri Tatchell thwarted half of my previous theories about the direction Chappie would take. Although it began quite predictably, it didn’t take too long for it to get off the beaten path and venture into more interesting territory. Chappie’s adoption into Ninja’s gang (a major portion of the movie) reminds me of a scene from Short Circuit 2 when Johnny 5 is initiated into a carjacking gang after stealing an entire street’s worth of stereos. Chappie tries and succeeds at stealing our hearts. He is fun to watch and equally as touching, hanging onto Ninja, Amerika and Yolandi’s every word and doing as he’s told with childish enthusiasm. Yolandi provides the maternal care for Chappie’s well being and although she is aware of the need to commit the heist, she worries for the safety of her shy child. Yolandi’s kind words keep Chappie from ever going into the “I’m different in a bad way” depressive streak that Johnny 5 did, which allows more focus on Chappie’s efforts to really fit in. But while Yolandi acts as a mother figure, Ninja and Deon become his father and creator respectively and provide contrasting philosophies. Ninja, being the hard born gangster type, tries to instill the street scarred alpha male mentality to keep Chappie alive. Deon however, is more concerned about the long term spiritual impact this will have upon his creation. This proves challenging, as Deon is cast in a role comparable to God, and becomes the target of Chappie’s questions and existential frustrations when he discovers that his battery’s limited lifespan foretells a mortal’s death. Hundreds, if not thousands of technical details make Chappie come to life on the screen, from the shapes his pixel eyes take, to his voice, to the subtleties of his body language. Many of these elements would be lost on the reduced television budget, and without these tiny wonders, Chappie would not have the heart it does. 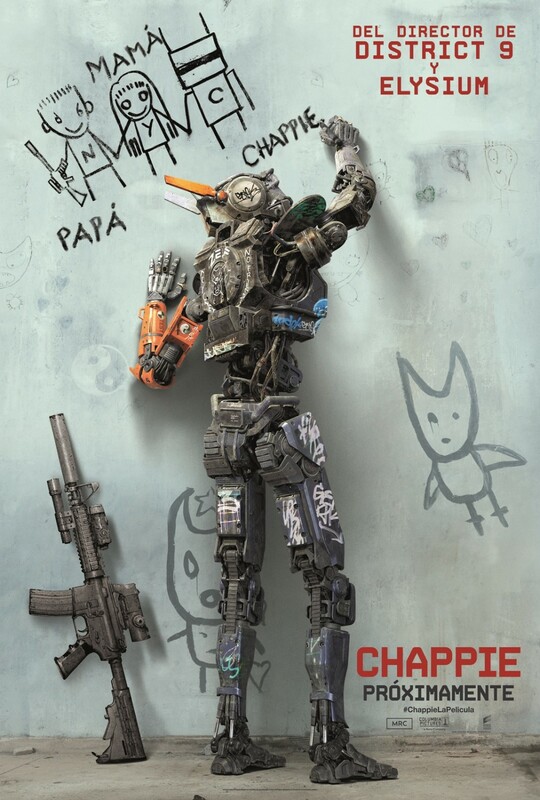 But Chappie as a movie is perhaps too ambitious, which prompts mixed feelings. The plot seemed too large for a movie and left several plot wrinkles and holes. Modern films face stiff competition from the story-telling of television, which command bigger and better plots and more time to build genuine transitions of any given situation. This showed in a scene where Hippo decides to start trouble, and the city instantly goes into a full-scale riot. Another point of disappointment has to be the character Vincent Moore. Despite Hugh Jackman’s impressive acting abilities, Deon’s villainous rival seemed little more than a half baked right-wing caricature. In one scene, the former soldier insists on the superiority of human moral judgment before making extremely violent threats in the workplace against a coworker with a pistol. Then he tries to pass it off as a joke and extends an invitation to attend church, as if the jest’s poor taste and lack of workplace disciplining wasn’t enough. While Vincent’s resentment of Deon’s success was founded early, there never seems to be any further character development than that. Jackman’s character never has a chance to really be understood by the audience. The ED-209 or TX-55 inspired Moose, Vincent’s creation, also doesn’t strike me as well thought out. The walking tank was too large to enter regular buildings. Its weaponry, which included cluster bombs and a pair of disemboweling scissors, strike me as egregious human rights violations, even when police would be authorized to use lethal force. While the situation is tough on the streets of this fictional Johannesburg, I doubt that a real company would have wasted funds building a prototype for the police with such excessive firepower. Much less allowing it passed the business proposal stage. 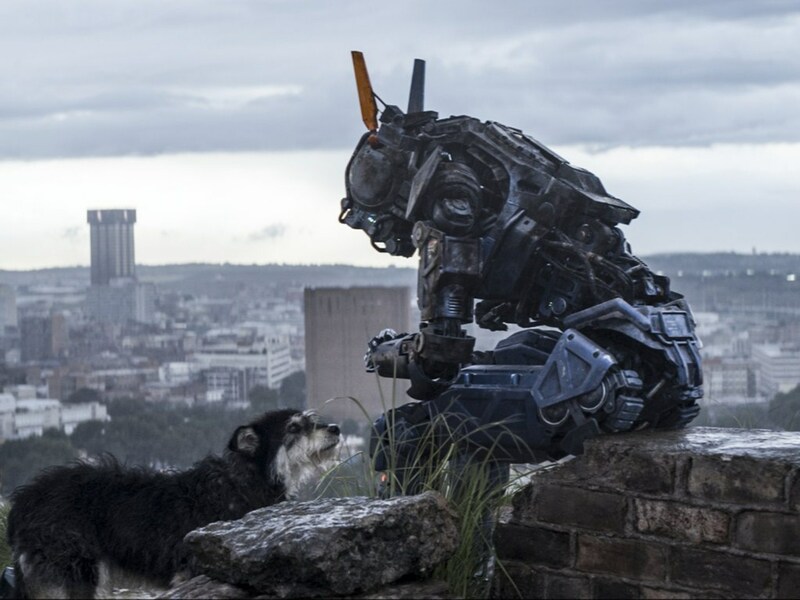 Despite its faults, Chappie is more good than bad. It carries a solid mix of heart, thought and potential that generally overcomes weaknesses in the plot and some under developed characters. Still, I can’t help but wonder if these problems will continue to be a growing issue with Blomkamp’s future work. District 9 is inevitably the one piece of science fiction to which all his titles has and will be compared, chiefly because of how it twisted an otherwise contentious political issue into something interesting and emotionally invested. Between District 9, Elysium and now Chappie there seems to be a general decline in the quality of Blomkamp’s efforts. I certainly hope Chappie is the lowest point in Blomkamp’s expanding filmography. Catch Chappie in theaters this Friday. 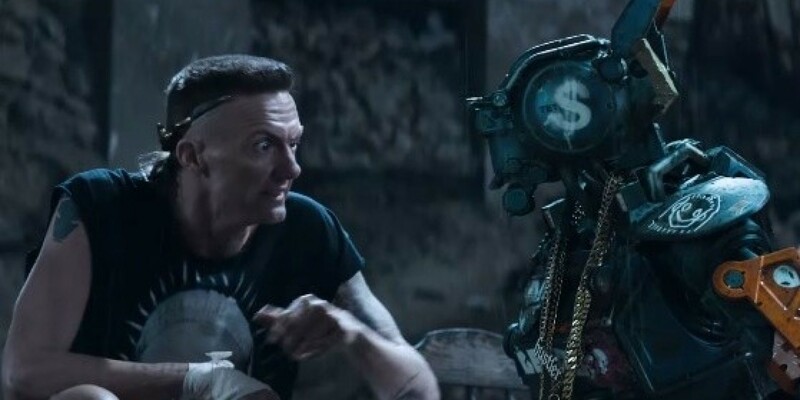 This entry was posted in Reviews and tagged Chappie, Dev Patel, Die Antwoord, Hugh Jackman, Neill Blomkamp, Robocop, Sharlto Copley, Short Circuit, Sigourney Weaver, Watkin Tudor Jones, Yolandi Visser. Bookmark the permalink.